On Thursday, March 15th, 2018, at approximately 8:20 p.m., Members of the Smithfield Police arrested Dustin Santagata, age 26, of 3 Ursula Road, Smithfield. Santagata was charged with Possession with Intent to Deliver Marijuana, Possession of Weapons when Committing a Crime of Violence and Possession of Marijuana. Santagata was taken into custody without incident, held overnight and brought to Third District Court in Warwick, in the morning. Smithfield Detectives had received information of illicit drugs being distributed within the Town of Smithfield. Detectives conducted surveillance of the suspected individual and obtained probable cause to obtain a search warrant for his residence, vehicle and person. 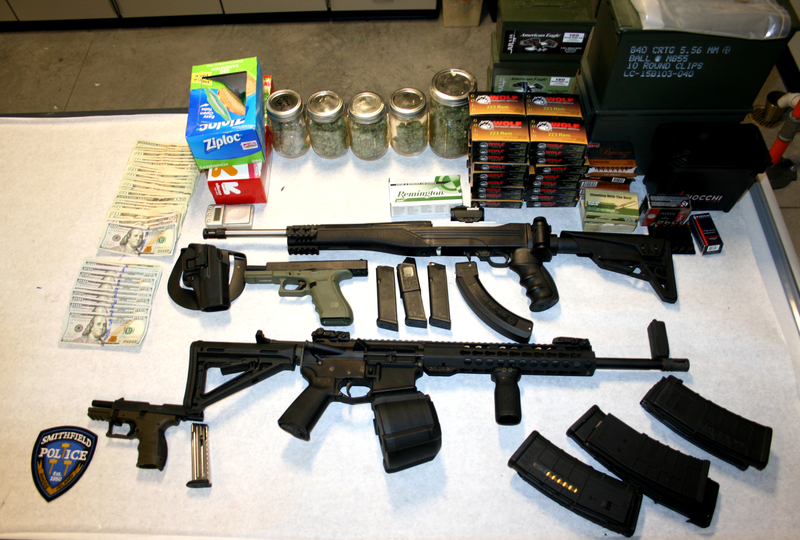 Smithfield Detectives seized the following items during the execution of the search warrant: over five ounces of marijuana, four firearms, including an AR-15 rifle, 2000 rounds of ammunition, a 2016 Honda Accord and $2,200 in cash. Mr. Santagata appeared before Magistrate Joseph P. Ippolito, in Third District Court, Warwick. Santagata was held without bail and is next scheduled to appear in District Court, Warwick, for a bail hearing on March 29th, 2018.